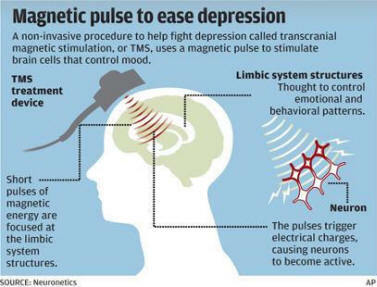 Transcranial magnetic stimulation is safe and noninvasive means of getting electrical energy across the insulating tissues of the head and into the brain. A powerful and rapidly changing electrical current is passed through a coil of wire applied near the head. The magnetic field, oriented perpendicular to the plane of the coil passes virtually unimpeded through the scalp and skull. 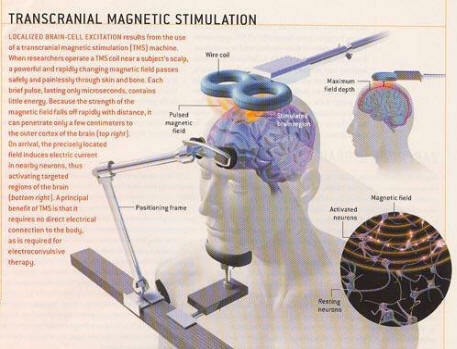 In the brain, the magnetic field produces currents in the induced electrical field lying parallel to the plane of the coil. 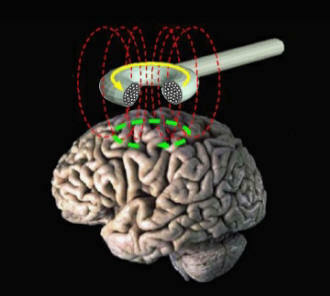 These currents are able to excite neural processes lying in the plane of the induced field in a manner roughly analogous to direct cortical stimulation with electrodes. In properly designed experiments, TMS can be a powerful physiological probe of cortical cortical function for clinical and basic neurophysiology. It is also an effective technique for altering the responsiveness of human brain circuits and may have therapeutic applications, as well. DC brain polarization is a decades old technique for modulating the activity of neural tissues. These effects are highly selective for the polarity and the orientation of neurons in the field. The older literature contains instances of its ability to produce overt changes in behavior and newer studies show that quantifiable alterations in human cortical responses can be produced safely. We are investigating how to use DC fields to modulate and improve human cognitive performance.